Installation in the A4000T requires the replacement of the electrolytic capacitor CE164C with a lower-profile type. In an A1200 computer, the hard disk cradle is in the way, so a hard disk drive must be placed elsewhere. Other Amiga models are not supported. The Mk2cr sports a DVI-I connector instead of the usual VGA socket. 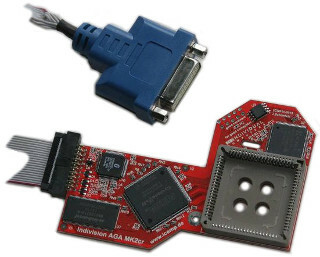 DVI-I provides digital as well as analog signals, so you can use modern TFT displays, older TFT displays with analog input or CRT monitors alike (the latter two with a VGA adapter). Please don't forget to use the configuration options to add a VGA or HDMI adapter if you intend to use the Mk2cr with a monitor that has no DVI but a VGA or HDMI input. The output pixel clock can go up to 135 MHz (the former Indivision AGA only allowed up to 71 MHz), the data rate reaches more than 480 MBytes/s peak performance (used to be 330 MBytes/s peak); 50 Hz modes (e.g. PAL) can be promoted to 60+ Hz and thus be displayed on modern monitors; 16 MBytes framebuffer, entirely addressable (used to be 12 MBytes previously); supports S-Hires and full 24-bit colour depth; unlike other internal flicker fixers, the Mk2cr supports the BorderBlank flag. A subtle semitransparent OSD replaces the splash screen of the predecessor model. The Mk2cr is plugged over the Lisa chip, no other connection to the motherboard is required (unlike other internal flicker fixers that also require a connection to Alice). Due to a much enhanced 84-pin PLCC socket being used, the Indivision fits like a glove and won't come off easily. Modern FPGA technology and low power consumption (1.2V core voltage) make sure to save energy and avoid heat problems. Hardware updates can be downloaded from the Internet. 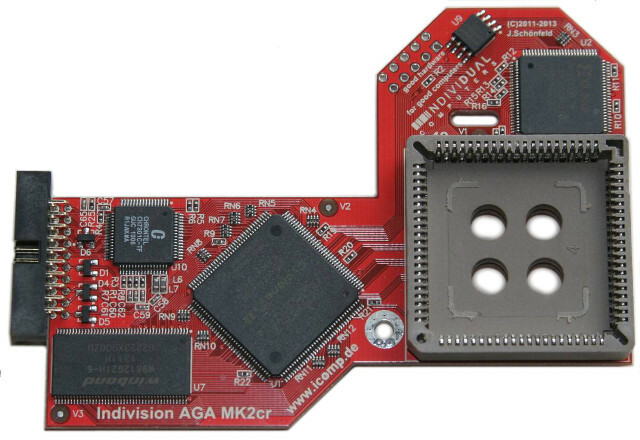 Even timing corrections are possible, allowing the Indivision AGA Mk2 CR to adapt even to the strangest chipset combinations (e.g. Lisa chips made by NCR). The configuration program and the current version of the flash program are rather expert tools than an example of user friendliness. You can get the software directly here: flash tool and core (pre-release version).